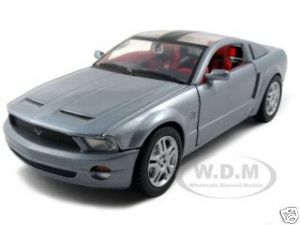 Find your favorite Mustang Diecast Cars 2002-2004 right here. Whether you're looking for a copy of your favorite Ford Mustang for your showcase, or a sturdy diecast metal car for the little enthusiast, this is the place. Click the blue links more information, including prices and other color choices. If you don't see your favorite year of Mustang diecast cars on this page, check out the side buttons for listings for every year from 1964 1/2 to present. 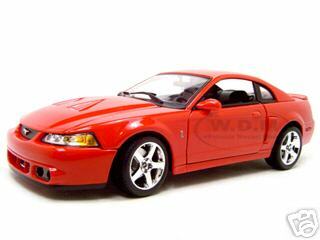 This Bright Red 2003 Mustang SVT Cobra Coupe is made in 1/18 scale and features opening doors, hood and trunk. 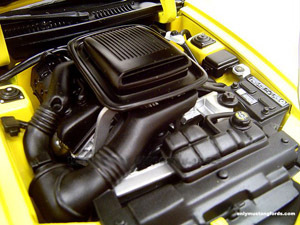 Under the hood is a very detailed SVO Mustang engine with a whipple supercharger. The 40th Anniversary of the Mustang was probably marked best by the sleek and fast 2004 Mach 1 just like this beautiful dark shadow rendition, in gleaming gray, with "shaker" hood scoop and a rear wing spoiler, hailing back to the glory days of the late 1969 to 1973 Mach 1 and Boss 302 cars. Built to exacting specifications, your Mach 1 is highly detailed at 1/18 scale and crafted true to the essence of the 2004 model year. 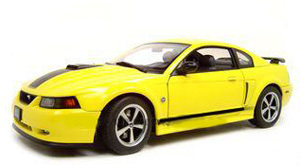 If your favorite Mustang is a 2004 Mustang Mach 1 , this is the diecast car for you! It's a 1/18 scale detailed little marvel that's painted in Screaming Yellow. It features a nice detailed engine compartment, complete with the famous shaker hood scoop and air cleaner. There's also opening doors and trunklid. If you know your concept cars, you'll recognize this very cool 1/24 scale 2004 Mustang GT Convertible Concept as the styling concept for the new Mustang which appeared in 2005. You'll also see some of what's to come too, including both Ford Mustang and Shelby styling (check the hood).